Prophets often come in strange guises and from unexpected places. Although their message may point to the spiritual nature of the universe, they themselves may not be religious. Václav Havel was such a prophet. He began his career as a playwright. He also wrote poetry and essays and gained international prominence as a dissident leader in the Velvet Revolution that led to the ouster of the communist leadership of Czechoslovakia. Havel later became the last president of Czechoslovakia and the first president of the Czech Republic. [M]oral relativism, materialism, the denial of any kind of spirituality, a proud disdain for everything supra-personal, a profound crisis of authority and the resulting general decay, a frenzied consumerism, a lack of solidarity, the selfish cult of material success, the absence of faith in a higher order of things or simply in eternity, an expansionist mentality that holds in contempt everything that in any way resists the dreary standardization and rationalism of technical civilization. The remedy for such cultural decline lies in the “spiritual dimension,” Havel wrote. If western democracies are to “survive [and] expand and resolve” their “conflicts of cultures,” they must rediscover and renew the “transcendental origins” of their best cultural values. Havel’s remedy stood, and still stands, in stark contrast to the secular vision of the West’s cultural and political elites. His remedy is very much in sync with what C. S. Lewis and others call the natural law. And while it isn’t based on Biblical religion, it appeals to a moral nature that is built into the universe—to the “law written on the heart,” in the words of the apostle Paul. In an address to the US Congress in 1990, Havel used “order of being” and “higher authority” as God-substitutes to describe the moral ground of the universe. [W]e still don’t know how to put morality ahead of politics, science and economics. We are still incapable of understanding that the only genuine backbone of all our actions, if they are to be moral, is responsibility. Responsibility to something higher than my family, my country, my company, my success–responsibility to the order of being where all our actions are indelibly recorded and where and only where they will be properly judged. The interpreter or mediator between us and this higher authority is what is traditionally referred to as human conscience. If I subordinate my political behavior to this imperative, mediated to me by my conscience, I can’t go far wrong. If, on the contrary, I were not guided by this voice, not even 10 presidential schools with 2,000 of the best political scientists in the world could help me. While Václav Havel, who died in 2011, was not a Christian, he is still a very helpful ally to those of us who are. He made a profound and persuasive case concerning what is wrong with contemporary culture. And his writing points in the right direction for a solution—to the transcendent order that undergirds the material world. As a postscript, Havel’s life and work reminds of a comment made by Harry Blamires fifty years ago in The Christian Mind: How Should a Christian Think? (pp. 8-9). [P]rophetic condemnation of salient features of contemporary secularism comes nowadays from secularists themselves whose ground of judgment is a humanistic one. It is clear that where there is no Christian mind to pass judgment upon society, those who care for human dignity and integrity on other grounds than the Christian’s will be provoked to rebel against multifarious tendencies of contemporary civilization to depersonalize men and women. This rebellion must be regarded as a significant feature of the post-Christian world. It is good in itself. That is to say, the protest needs to be made. Blamires deplored, just as we too must today, the lack of Christian thinking that would enable Christians to speak with the depth of prophetic insight of a Václav Havel. Václav Havel’s commitment to “living in truth” as opposed to “living within the lie” is best expressed in his parable of the greengrocer, which is found in his essay “Power to the Powerless.” An excerpt that contains that parable can be found here. 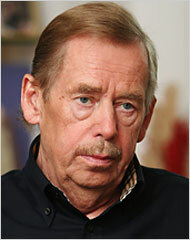 Václav Havel’s address to the US Congress, 21 February 1990 is available here. “Forgetting We Are Not God,” published in First Things in 1995, can be found here.